Andrew Yan-Tak Ng (born in 1976) is Chief Scientist at Baidu Research in Silicon Valley. In addition, he is an associate professor in the Department of Computer Science and the Department of Electrical Engineering by courtesy at Stanford University. He is chairman of the board of Coursera, an online education platform that he co-founded with Daphne Koller. He researches primarily in machine learning and deep learning. His early work includes the Stanford Autonomous Helicopter project, which developed one of the most capable autonomous helicopters in the world, and the STAIR (STanford Artificial Intelligence Robot) project, which resulted in ROS, a widely used open-source robotics software platform. Ng is also the author or co-author of over 100 published papers in machine learning, robotics and related fields, and some of his work in computer vision has been featured in a series of press releases and reviews. In 2008, he was named to the MIT Technology Review TR35 as one of the top 35 innovators in the world under the age of 35. In 2007, Ng was awarded a Sloan Fellowship. For his work in Artificial Intelligence, he is also a recipient of the Computers and Thought Award (2009). 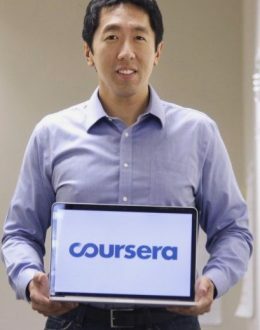 In 2011 he led the development of Stanford University’s main MOOC (Massive Open Online Courses) platform and also taught an online Machine Learning class to over 100,000 students, leading to the founding of Coursera. Ng’s goal is to give everyone in the world access to a great education, for free. Today, Coursera partners with some of the top universities in the world to offer high quality online courses, and is the largest MOOC platform in the world. Ng also works on machine learning with an emphasis on deep learning. He founded and led the “Google Brain” project which developed massive-scale deep learning algorithms. This resulted in the famous “Google cat” result, in which a massive neural network with 1 billion parameters learned from unlabeled YouTube videos to detect cats. More recently, he continues to work on deep learning and its applications to computer vision and speech, including such applications as autonomous driving.